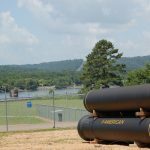 Read more about Huntsville Utilities Southeast Water Treatment Plant in the July 2017 issue of Water & Wastes Digest. See photo gallery at end of article. Established in 1823, Huntsville Waterworks was the first municipal water system in Alabama. At the time, the population in the area was only about 1,300 people. Fast forward almost 200 years. The population of the city of Huntsville is now estimated at more than 190,000, and it has been the fastest growing major city in Alabama the past 15 years. 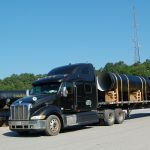 For Huntsville Utilities Water Department, the best solution to meet this ever increasing demand and continue providing customers with reliable drinking water was to build a third surface water treatment plant. 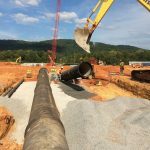 The Southeast Water Treatment Plant is being built on a 266-acre site near Lake Guntersville in Marshall County, Alabama. 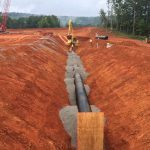 Its treatment capacity will initially be 12 MGD (million gallons a day), 24 MGD within three years and 96 MGD at total build-out. Construction of the Southeast Water Treatment Plant began in 2015, and is scheduled for completion in spring 2017, more than a year ahead of schedule. The estimated cost of the project is $90 million. 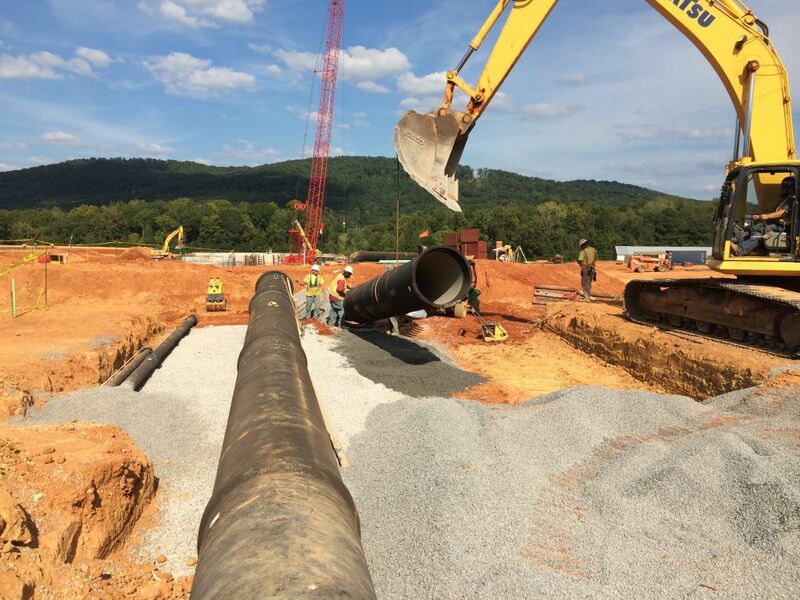 AMERICAN Ductile Iron Pipe is providing more than 20,000 feet of 42-inch pipe that will transmit raw water from Lake Guntersville to the new treatment facility, and approximately 40,000 feet of 48-inch pipe that will carry finished water to Huntsville Utilities distribution system. 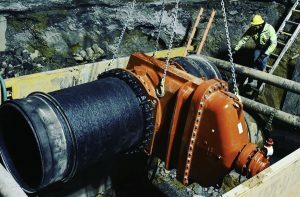 In addition, AMERICAN Flow Control is supplying a total of 30 Series 2500 resilient wedge gate valves in sizes 6 to 16 inches, and 14 American-Darling B-84-B fire hydrants. 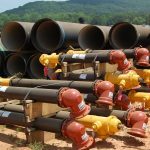 Tetra Tech, Inc. is the engineer for the project, providing site selection, water quality testing, pilot studies, permitting, design, bidding services and administration. Members of the Tetra Tech team involved in the project include Design Manager John Toomey, Senior Technical Consultant James Christopher, Project Engineer David Lavergne and CAD Manager Jon Evans. 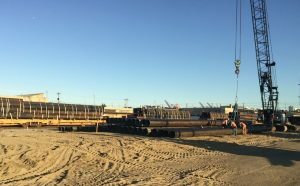 The entire project was designed in 3D, allowing the engineer to create more consistent contract documents with minimal errors and change orders. Brasfield & Gorrie is the general contractor for the project. 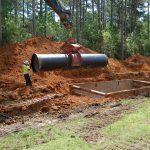 Garney Construction is the subcontractor, constructing the raw water intake structure, and installing raw and finished water transmission lines. 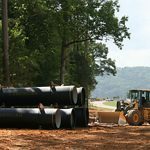 “This project stretches over 10 miles, from the new raw water intake structure on Lake Guntersville to the new water treatment plant and then through three municipalities – Grant, New Hope and Owens Crossroads – until it reaches Huntsville Utilities’ primary distribution system,” said Brasfield & Gorrie Operations Manager Tony Stephens. 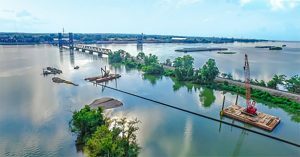 “The work involved coordination with several government agencies including Tennessee Valley Authority (TVA), Corps of Engineers, Alabama Department of Transportation (ALDOT), Fish and Wildlife, and Alabama Department of Environmental Management (ADEM). 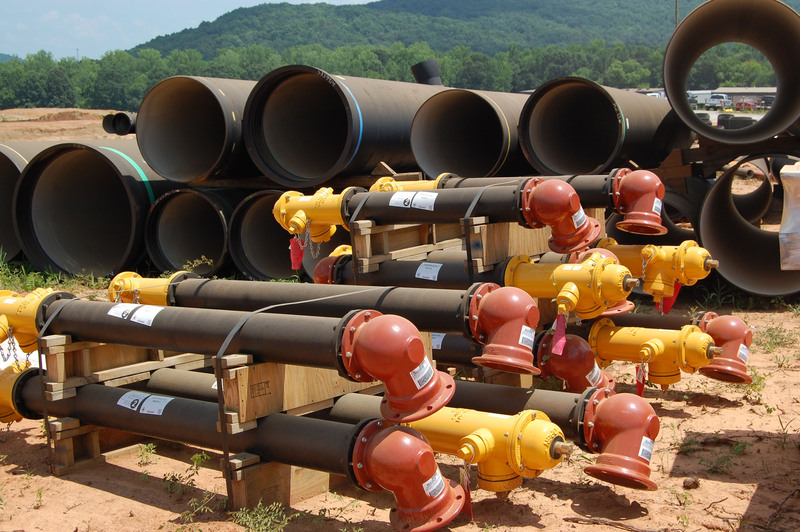 Huntsville Utilities provides drinking water to more than 90,000 customers. 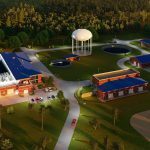 Once the Southeast Water Treatment Plant is complete, the utility’s system will include three surface water treatment plants, and three groundwater plants and wells. 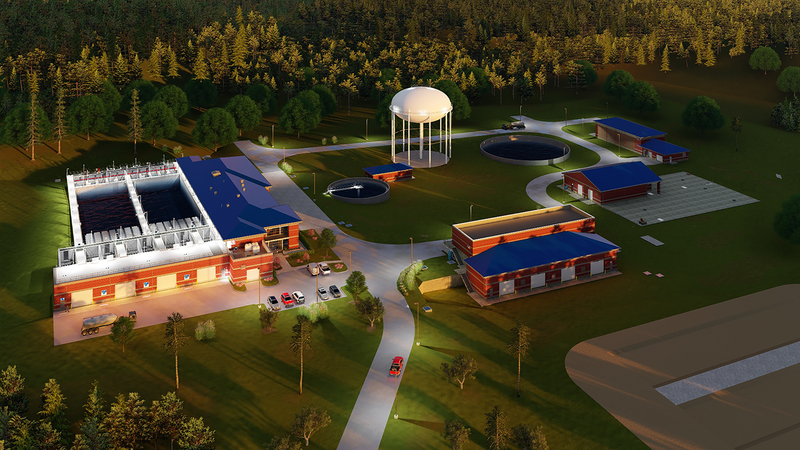 A rendering of the new Southeast Water Treatment Facility. 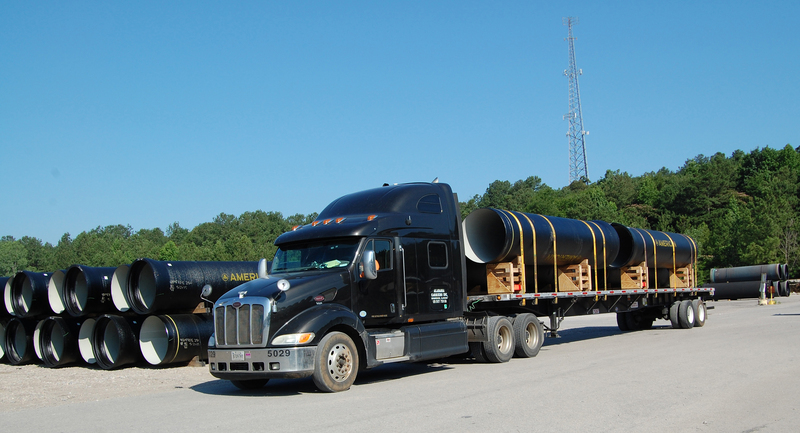 Photo provided by Tetra Tech, Inc.
AMERICAN Ductile Iron Pipe is loaded up and ready for shipment to Marshall County, Alabama. 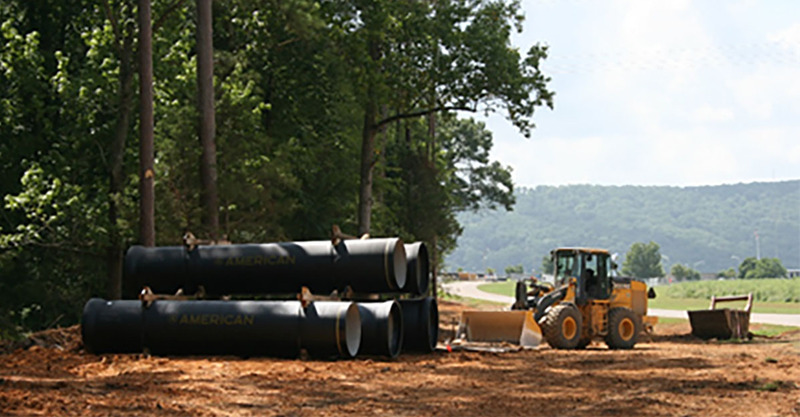 AMERICAN is providing more than 60,000 feet of 42- and 48-inch ductile iron pipe for raw and finished water transmission lines as part of the Southeast Water Treatment Plant project. 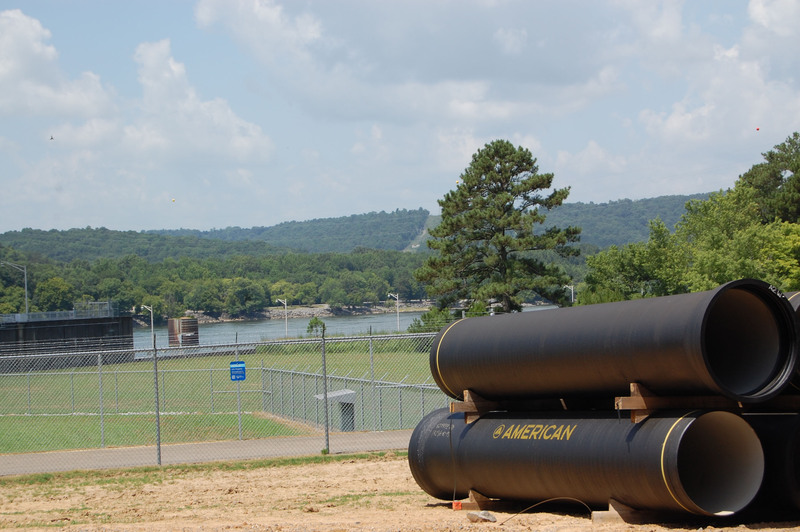 42-inch AMERICAN Ductile Iron Pipe will carry raw water from Lake Guntersville to the new treatment facility. 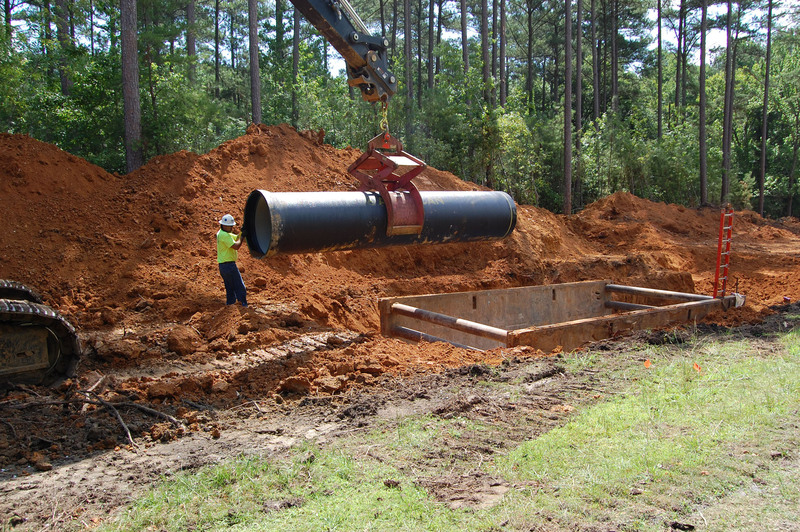 AMERICAN Ductile Iron Pipe being installed under the new treatment facility. 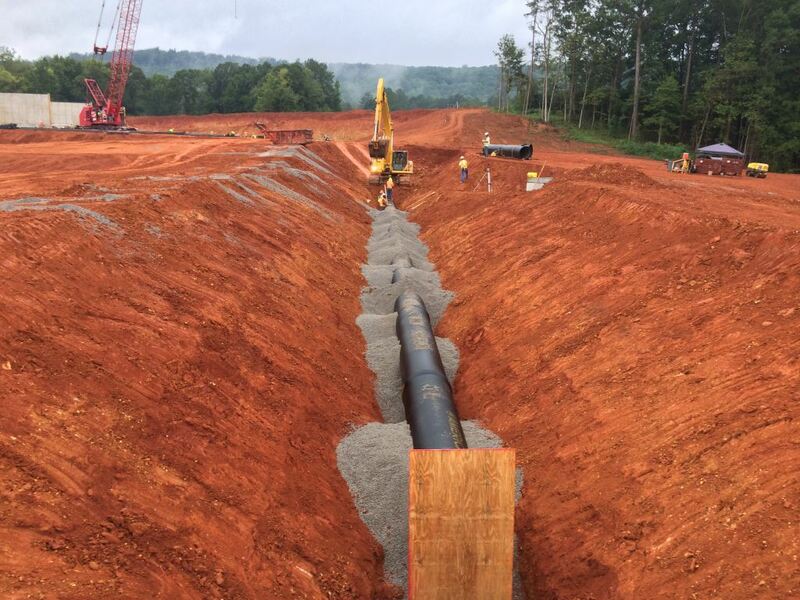 Photo provided by Tetra Tech, Inc.
AMERICAN Ductile Iron Pipe is installed near the new water treatment facility. Photo provided by Tetra Tech, Inc.